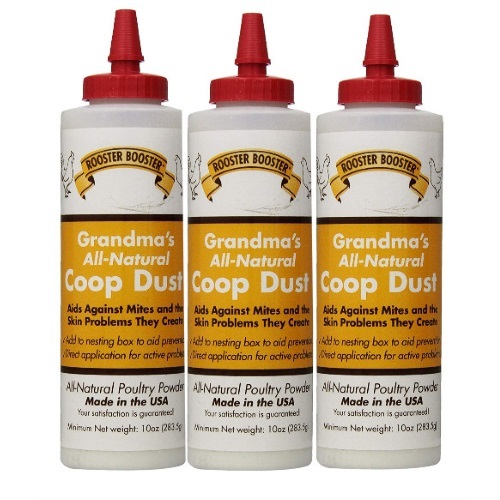 Grandma's All-Natural Coop Dust by Rooster Booster is perfect for keeping chicken as healthy as possible. The story goes that Grandma used to have her poultry flock roaming free all day long. They lived off the land and took frequent dust baths in order to keep free of pests and mites. But when Grandma had to move closer to town, her birds lived in a side yard without as much space. Without as much as room to roam, her birds weren't dusting themselves. Grandma devised her solution-- All-Natural Coop Dust. This blend is a proprietary mix of multiple types of food-grade clays, earth, silicates and 15% natural mineral salts. For best use, dust nesting boxes once per week-- both above and below bedding. For skin that is flaking or in the presences of live mites, puff powder directly onto bird and gently fluff into feathers and skin once daily. Purchase includes three 10oz bottles.